Borderlinx | Buy Land Rover and ship worldwide with Borderlinx. Cheap rates guaranteed. Land Rover USA is a British brand of four-wheel-drive vehicles. Founded in 1948, Land Rover USA is the second oldest four-wheel drive car brand in the world. Land Rover USA makes luxury SUVs that are extremely solid, safe, comfortable and versatile. Land Rover USA vehicles are known for their high rankings in terms of safety, luxury, utility, strength, and design. Land Rover USA is committed to a sustainable future, and therefore uses efficient power systems, lightweight structures and reduced emissions. Land Rover USA also invests in sustainable manufacturing, advancing knowledge and improving lives. Land Rover USA Range Rovers, which include the Range Rover Evoque (the most compact of the series), the Range Rover Sport, the Range Rover Long-Wheelbase and the Range Rover are known for their high luxury. The Land Rover USA LR4 comes with 7-seat versatility for large families. The Land Rover USA LR2 series which start at 37,495 are SUVs that are perfect for both city life and country life for their smaller size and amazing abilities. Land Rover USA vehicles are constructed with immense attention to detail, offer many options for personalization and luxury touches. 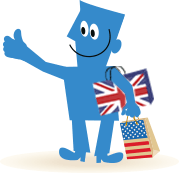 Shop Land Rover in the USA and ship to your home country with Borderlinx. You pay cheap international shipping, tax & duties upfront, which you can calculate using our shipping cost calculator. A number of services are available through Borderlinx to make international ordering from Land Rover USA hassle-free, including concierge, free repacking and consolidation services.